for courage, zeal , and attention to duty in action against hostile Sioux Indians at Wounded Knee Creek, South Dakota, especially after having been severely wounded through the lung. Sergeant George Loyd was one of the most experienced non-commissioned officers at Wounded Knee and one of a handful of enlisted soldiers present that day who had survived the Battle of the Little Bighorn. Records do not indicate where Loyd was on the battlefield on 29 December 1890. 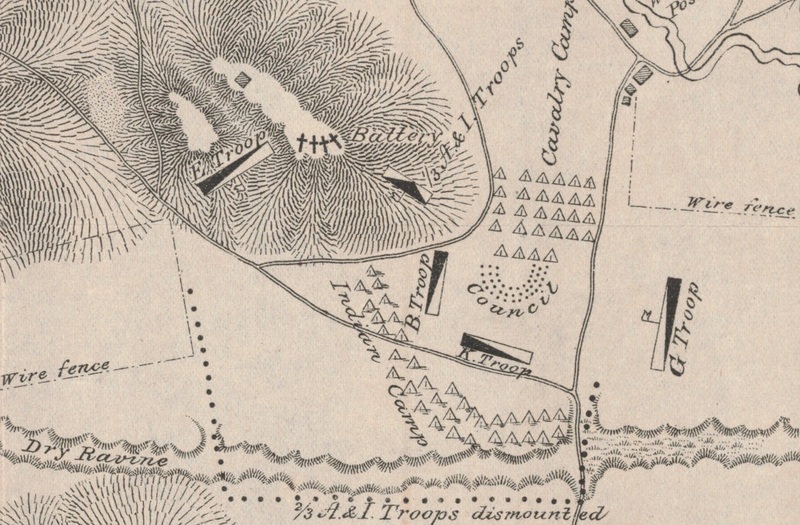 His unit was divided in two groups with one-third of A and I Troops located on the hill just west of the cavalry camp, and two-thirds dismounted as sentinels surrounding the east, south, and west sides of the Indian camp. Ball entered to right of sternum just below clavicle, passed backwards and outwards, obtaining exit at axillary line in the fifth intercostals space, where incision was made, and the ball removed, with pieces of blouse and fragments of undershirt. Pneumonitis followed. Captain Nowlan recommended Sergeant Loyd for the Medal of Honor on 15 March 1891. The regimental adjutant endorsed the letter the same day, and the Department Commander, Brigadier General Wesley Merritt endorsed it two days later. By the end of the month the Commanding General of the Army, Major General John M. Schofield, endorsed it, and the Acting Secretary of War Lewis A. Grant issued a medal on 16 April. 29 December 1890: 1st Sergeant (then Sergeant) George Loyd, for courage, zeal , and attention to duty in action against hostile Sioux Indians at Wounded Knee Creek, South Dakota, especially after having been severely wounded through the lung. Nine of the nineteen 7th Cavalry troopers that were awarded Medals of Honor during the Pine Ridge Campaign were immigrants. Three of those nine were Irish, including the highly experienced non-commissioned officer, forty-seven-year-old Sergeant George Loyd, who was born in County Tyrone in Northern Ireland. He had a ruddy complexion, light hair and blue eyes, and he stood five-feet-eight-inches in height, although some records put him as tall as five-nine or as short as five-four-and-a-half. By December 1890 he had over twenty-four years of experience in the saddle with the 6th and 7th Cavalry Regiments. Loyd’s initial three-year enlistment on 17 March 1866 at Philadelphia, Pennsylvania, placed him in I Company, 6th Cavalry. However, this was not the twenty-three-year-old’s first taste of the military, as he listed his occupation as “Soldier,” likely having served in the Union army during the Civil War. Loyd’s duty with the 6th Cavalry took him to Texas for three years where he served for a time under the able command of Captain Adna R. Chaffee, and likely saw action at Paint Creek, Texas in March 1868. He served for a time as one of I company’s farriers and completed his enlistment at Canton, Texas, as a corporal. 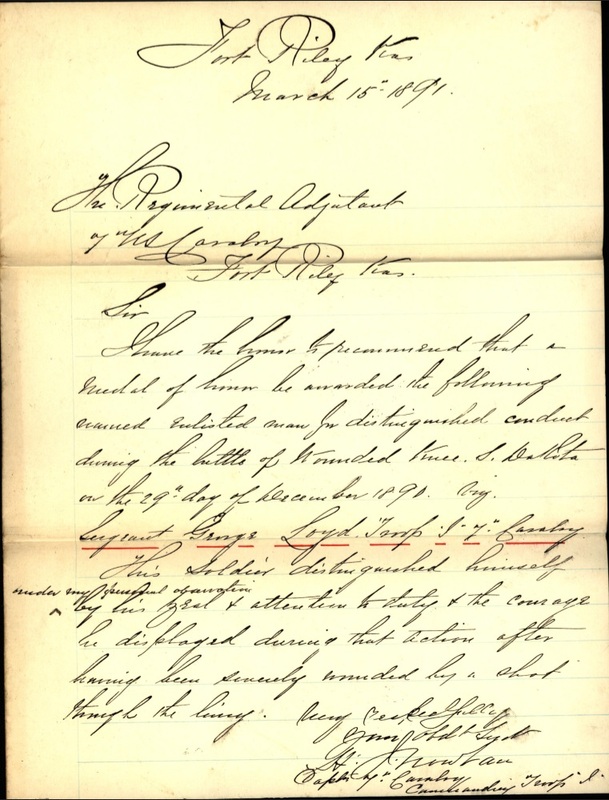 Loyd immediately reenlisted in March 1869 for another five years with the 6th Cavalry and continued to serve with the regiment at Camp Supply, Indian Territory. George Loyd finished his second enlistment with the 6th Cavalry as a Private and appeared to have had enough of the regiment. Leaving Camp Supply at the end of March 1874, Loyd showed up in Saint Louis, Missouri, three weeks later and enlisted for a five-year-term in the 7th Cavalry where he was assigned to Captain John E. Tourtellotte’s G Company. His first five years with the already storied 7th Cavalry were adventurous. His troop saw action on the Black Hills Expedition the year he enlisted and fought in the Valley and Hill Top fights at the Little Bighorn two years later where they suffered thirteen killed and six wounded in action. Loyd regained his corporal stripes that summer filling one of four vacant non-commissioned officer positions. His troop saw action again the following year in September 1877 at Canyon Creek in the Montana Territory. Following that battle, Captain Frederick Benteen mentioned Sergeant Loyd and several others by name, “…for the conspicuous gallantry displayed in the two separate charges… on a concealed enemy, routing them in both instances from their well-concealed positions.” Loyd completed his third Army enlistment in April 1879 as a sergeant at Fort Abraham Lincoln, Dakota Territory, and immediately reenlisted for a fourth term. Loyd’s next two terms of enlistment saw him transferred from G Troop to Captain Henry J. Nowlan’s I Troop. The following year, 1892, would prove too much for the seasoned and decorated cavalry soldier. In September, he fell down a flight of stairs at Fort Riley and fractured a rib. Two months later he was thrown from his horse into a tree and broke another rib. Whether affected by his recent injuries or suffering from “soldier’s heart,” or what today we would call Post-Traumatic Stress Disorder, First Sergeant George Loyd took his own life on 17 December 1892. The local paper ran the following news story. Junction City special: First Sergeant George Loyd, I troop, Seventh cavalry, one of the oldest soldiers at the post, committed suicide by shooting himself through the head. Death was almost instantaneous. Sergeant Loyd has seen hard service and has been wounded a number of times. At the battle of Wounded Knee he was shot through the body and was left for dead. Since then he has had two ribs broken and it is thought he was deranged when he committed his last rash act. The Fort Riley Assistant Surgeon recorded the nature of the wound on a Record of Death, and Loyd’s new commander, Captain Ernest Garlington, sent his effects, including the sergeant’s Medal of Honor to an unrecorded recipient. 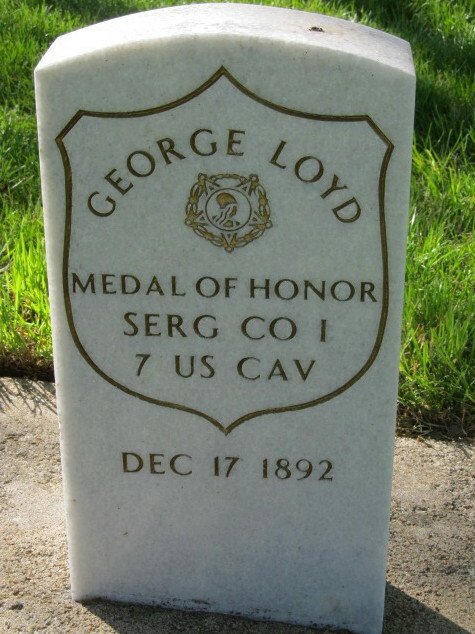 Forty-nine-year-old First Sergeant George Loyd was buried in the post cemetery that winter of 1892. Fourteen years later, he would be joined by twenty nine of his fellow 7th Cavalry troopers when their bodies were removed from the Pine Ridge Agency Cemetery and relocated to the Fort Riley Post Cemetery. First Sergeant George Loyd’s is buried in the Fort Riley Post Cemetery. United States War Department, Annual Report of the Secretary of War, (Washington: Government Printing Office, 1892), 150-155. Map of Wounded Knee. Adjutant General’s Office, “7th Cavalry Troop I Jan. 1885-Dec. 1897 Vol. 42,” Muster Rolls 1784-1912, Oct. 31 to Dec. 31, 1890. Charles B. Ewing, “Address to the Association of Military Surgeons of the National Guard, April 19, 1892,” The Boston Medical and Surgical Journal, Volume CXXVI, January – June 1892, (Boston: Damrell and Upham, 1892), 465. United States Congress, “Senate Document No. 58, General Staff Corps and Medals of Honor, July 23, 1919,” 66th Congress, 1st Session, Senate Documents Vol. 14, (Washington: Government Printing Office, 1919), 410. Adjutant General’s Office, U.S. Army, Register of Enlistments, 1798-1914 [database on-line]. Provo, UT, USA: Ancestry.com Operations Inc, 2007; Eric S. Johnson, No Greater Calling: A Chronological Record of Sacrifice and Heroism during the Western Indian Wars (1865-1898), (Atglen: Schiffer Military History , 2012), 232-233. War Department, Annual Report of the Secretary of War on the Operations of the Department for the Fiscal Year Ending June 30, 1877, Vol. 1, (Washington: Government Prindting Office, 1877), 572. Johnson, No Greater Calling, 232-233. Western Kansas World., December 31, 1892, Image 8, http://chroniclingamerica.loc.gov/lccn/sn82015485/1892-12-31/ed-1/seq-8/ accessed 13 Jul 13. Adjutant General’s Office, Final Statements, compiled 1862-1899, (Washington: National Archives Record Administration), http://www.fold3.com/image/1/271303611/ accessed 31 Aug 2013. Lisa Osborn, photo., “Sgt. George Loyd,” FindAGrave, http://www.findagrave.com/cgi-bin/fg.cgi?page=gr&GSvcid=398104&GRid=6050746& accessed 30 Aug 2013. 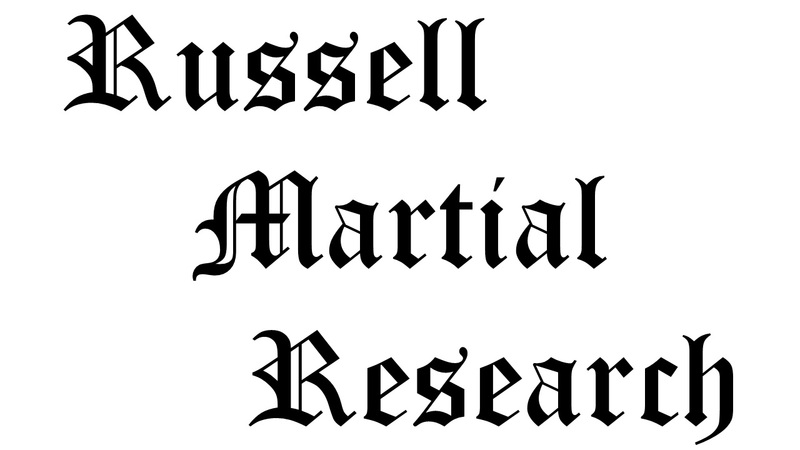 Citation for this article: Samuel L. Russell, “Medal of Honor Recipient First Sergeant George Loyd, I Troop, 7th Cavalry,” Army at Wounded Knee (Sumter, SC: Russell Martial Research, 2013-2015, http://wp.me/p3NoJy-7p), updated 19 Nov 2014, accessed date __________. This entry was posted in Award Recipients, Enlisted and tagged 7th Cavalry, 7th Cavalry Regiment (United States), Big Foot, Cavalry, George Loyd, Lakota, Medal of Honor, Miniconjou, Oglala Lakota, Pine Ridge Agency, Pine Ridge Indian Reservation, Sioux, Wounded Knee, Wounded Knee Creek, Wounded Knee Massacre. Bookmark the permalink. I recently came into possession of a digital copy of the majority of award recommendations stemming from the Pine Ridge campaign to include Captain Henry Nowlan’s letter recommending Sergeant George Loyd for the Medal of Honor. I have updated this post on 19 Nov 2014 to include a copy of that letter.